Proteins, the ubiquitous biomacromolecules in nature, constitute great numbers and most of biological composition or soft materials. Typical protein assemblies such as cellular cytoskeleton and muscles are built in a mild way via controlled assembling processes. Meanwhile, many protein-inorganic compounds, such as the hull and skeleton of animals, also demonstrate their fascinating architectures benefiting from the spontaneous organization: The assmbling process provide a structural scaffold while the mineral substrance combine with the ordered architecture, endowing the hybrid with high mechanical strength. Beside it can function well alone (enzyme, antibody, or serum albumin); proteins can also self-assemble into exquisite superstructures and undergo important cellular functions. Therefore, the protein assembling and resulting biomaterials attract more and more attention because of their unique defined structures and interesting functions. In biologic system, the assembling processes are usually driven by the multiple, weak noncovalent interactions, providing the protein-based biomaterials with dynamically reversible regulation for high performance and environmental adaptation. Based on the inspiration of the natural bottom-up strategies, people tempt to produce artificial protein assemblies with defined structures or interesting functions via designed noncovalent interactions. 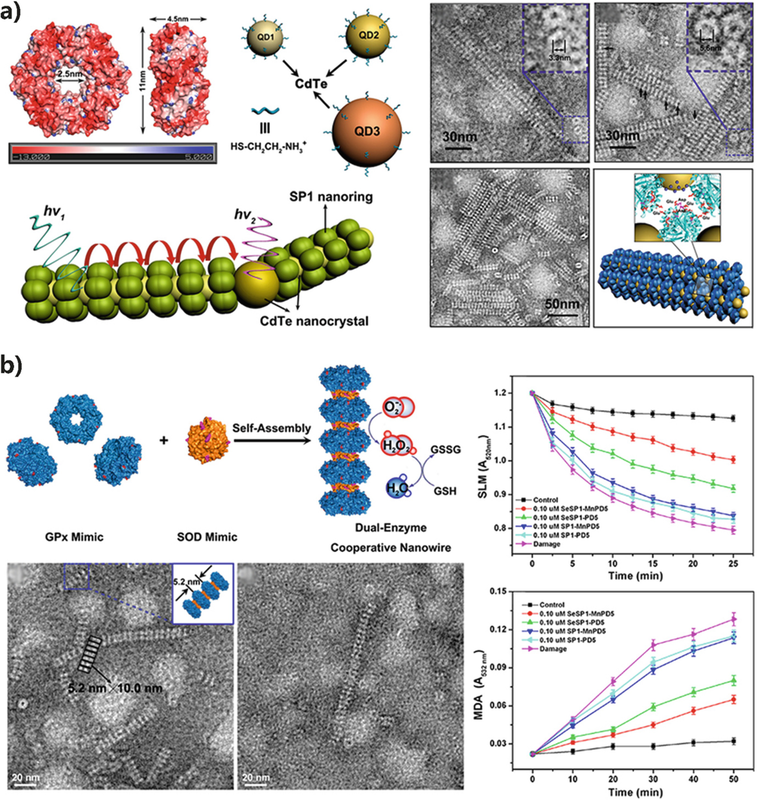 The development of supramolecular chemistry is rapid and provides a great opportunity for scientists to construct novel supramolecular assemblies as functional biomaterials. Supramolecular assemblies based on small organic molecules have been designed and achieved with a wide variety of nanostructures and functions. The abundant driven supramolecular interactions usually endow the materials with promising properties such as processability, self-healing, recyclability, and stimuli responsiveness. Therefore, designing and utilizing supramolecular interactions seem as a powerful method to induce molecular aggregation. Although scientists have begun to fabricate protein assemblies via supramolecular interaction in decades, precise manipulation of protein self-assemblies is still a challenge. Compared with assemblies through the specific small-molecule recognition, the interactions and assembling mechanism of protein assemblies are more complicated due to the structural complexity, heterogeneity, and instability of protein molecules which may cause undesirable cross binding and confusion. Therefore, precisely controlling binding sites, orientation, and specificity of the complex proteins during assembling process is the key of constructing protein assemblies via supramolecular interactions. The purpose of this chapter is to briefly introduce the field of protein self-assembly. The assembling mechanism, structures, function, and application of typical natural protein assemblies are first described to have an initial understanding of protein-based natural assembling. Then, several supramolecular strategies for precisely constructing protein assemblies with highly ordered hierarchical structures are reviewed. The mechanism of each supramolecular interaction is described, and some typical examples are represented from the aspects of design, modification, assembling process, and application. Finally, we summarize and prospect the further development of protein assembly. We hope this chapter could let the reader to appreciate the charm of protein self-assembly and the reviewed details could provide more inspiration for future design of protein assemblies as functional biomaterials. The development of microtechnique provides scientist with a powerful tool to understand the microcosm; various architectures in nature such as virus, filaments, and carboxysome were observed and further studied in the beginning. People marveled at the compelling architectures of the natural protein assembly, meanwhile feeling curious why the protein subunits could highly synergistically coordinate into a functional complex. Along the natural protein assembly, virus is earlier studied because it is a small infectious agent which can infect all types of life forms, from animals and plants to microorganisms, including bacteria and archaea. In 1892, when there did not exist the electronic microtechnique, Russian biologist Dmitri Ivanovsky begin to research the virus using filter which is now known as the tobacco mosaic virus (TMV) . In negative-strained TEM, TMV showed rod-like helical structure with 300 nm in length, 18 nm in diameter, and a 4 nm inner channel for RNA encapsulation. The rod-like “protein shield” was self-assembled from coat protein subunits and infection sections with guidance of genomic single-strand RNA, protecting RNA from digestion and playing vital roles in TMV infection . Beside the virus, the protein assemblies are also found in the broad fields in the living systems, such as actin filaments, amyloid fibrils, protein cages (ferritin), and protein complex (molecular chaperones, antigen-antibody composite) (Fig. 1), which are indispensable in biological functions. In other words, exploring the interaction and principles of thesis protein assembly is an access to understanding the miracles of life and providing the inspiration for designing advanced biomaterials. Here, in this section, we introduce three representative natural protein assemblies in species: actin filaments, amyloid fibrils, and ferritin. These three protein assemblies have close relationship with the consist of muscles, neurodegenerative associated diseases, and storage/release of irons, respectively. As units of actin filaments, the actin is ubiquitous and abundant in eukaryotic cells. Generally, the globular monomer (G-actin) would self-assemble into microfilaments (F-actin) which are important architecture blocks for construction of cytoskeleton and muscle cells. The growth of actin filaments provided the physical force and used to stabilize cellular structure and drive the transportation and motility process of cells. Besides, many cellular-associated proteins that regulate the poly-/depolymerization, nucleation, and cross-linking bind to actin and thereby execute their functions, revealing its vital role in species . The actin filament is a helical ribbon with two parallel strands that self-assembled from actin monomers, whose growth is regulated by the adenosine triphosphate (ATP) and adenosine diphosphate (ADP). The helical ribbon demonstrated about 8 nm width with a thickness of about 5 nm. The actin units were grown along the filament orientation and formed helical pitch of 36 nm . To our knowledge, there is no artificial helical protein assembly with two or single strands since now, so the assembling of actin filament is inspired for the construction of a helical biomaterial with low strands and high mechanical strength. The assembling of actin filaments were mediated by the nucleation-elongation polymerization, which is common in the biological system, that is, the assembling is adenine nucleotide dependent. 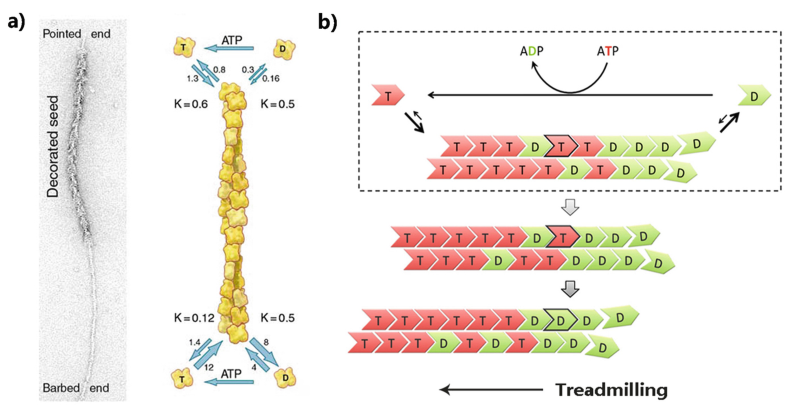 Both ATP and ADP could bind to the protein with a relatively moderate driving force (Ka in the order of 106−107 M−1 for ATP and about 5*105 M−1 for ADP); however, the elongation of ATP-actin is more favorable. The kinetic of two nucleotide actins for assembling is also a lot different, making the ATP-actin easier to participate in polymerization of actin filament. In the assembling process, one actin monomer combines to the hydrophobic groove of adjacent monomer with its D-loop hydrophobic region, linking the polymer chain together. Therefore, the structure of actin filaments is polarized, exposing a barbed (+) and a pointed (−) end . It is noteworthy that the polymerization of filaments is a dynamic process which is governed by the rapid kinetics of association and dissociation from both ends of actin filaments. The binding constants of ATP-actin and ADP-actin to the barbed end reach up to 1.2*107 M−1 s−1 and 3.8*106 M−1 s−1, respectively. In contrast, the bind rates of ATP-actin and ADP-actin monomer to the pointed end of actin filaments are one order of magnitude smaller. Filamentous actin also demonstrates an ATP hydrolysis activity, and the ATP-actin would slowly convert to ADP-actin after assembling, changing its binding kinetics to the polarity filaments . The different rate constants of two polarized ends and the kinetic difference between ATP-actin and ADP-actin on filament thereby give rising to the dynamic growth process, named “treadmilling.” The basic principle of the treadmilling is shown in Fig. 2: because the kinetic and exchanging rate of barbed end was more rapid than the pointed end, it promoted ATP-actin gathering at barbed end and ADP-actin enriched at pointed end. If the concentration of free ADP-actin in solution is below its chain elongation concentration, the ADP-actin trend to depart from the pointed end and cause its depolymerization, while the barbed end continues to grow. The length of filament would maintain a dynamic equilibrium when the growth and depolymerization occur at the same rate using the ATP as mediator. Because the released ADP-actin could turn back to ATP-actin in cell in the presence of ATP, the treadmilling process could be maintained through consuming the ATP as fuel and reusing the ATP monomers. The dynamic treadmilling plays a vital role in many nature and ubiquitous purposes; cells always realize their transportation and cellar motility and generate biological force via controlling this dynamic process . In summary, the filament is a highly dynamic natural protein assembly with rapid kinetic, and driven by the ATP concentration, the polar structure and ATP-cooperated elongation ensured the orientated polymerization and suppressed undesired random growth, making the filament a highly ordered and smart assembly. Based on the fascinating properties, people pay more attention on the potential applications and practical utilization of filaments. The high-protein assembly seems a perfect template for recruiting other proteins/functional components to prepare biomaterials. Willner and co-workers reported a methodology to synthesis conductive gold nanowires using the in vitro reproduced self-assembling filaments as template . Gold nanoparticles were first decorated on the filaments and subsequently disassociated via dialyzing off ATP to obtain Au NPs modified G-actin monomers. By controlling the reassembling order of modified/unmodified G-actin, the actin-based Au nanowire could locate in the middle or at the end of filaments. More compelling, when the actin-based Au nanowires were deposited on a surface coated with myosin (an ATP-triggered actin-binding motor protein can “walk” along the filaments), the nanowires could be mobilized on surface with addition of ATP, revealing their potential use as nanomotors/switches. Andreev and co-workers also report using the actin filaments as template to fabricate semiconductor nanowires. Based on the actin-myosin ATP-dependent nanomotors, the in vitro assembled filaments were also used for many applications. People have used it to transport single cells and prepared oriental nanomachine with heavy meromyosin (HMM)-modified silicon nanowires as support . There were other reports that the filaments, a fascinating candidate for construction of vesicles, demonstrated robust structure due to the mechanical stability of actin and were utilized as a drug delivery system. Amyloid fibrils are also ubiquitous in nature and associated with some diseases. The amyloids often mean aggregates of proteins or peptides folded (always misfolded) into fibrils with many copies sticking together. It has been found that some of neurodegenerative diseases such as Parkinson’s, Alzheimer’s, Huntington’s, and Creutzfeldt-Jakob disease were caused by the assembling of amyloid proteins, which lose their intrinsic functions, form fibrous deposits, and thereby disrupt the healthy function of tissues and organs . However, recent research demonstrated that amyloid fibrils also play vital roles in many biological systems such as bacteria curli fibrils, yeast prions, and spider silks, revealing its meaningful function and universal proteinaceous materials for practical application . Amyloids are structural unbranched fibers or twist formed from cross-beta sheet, in which antiparallel chains of beta-stranded peptide are oriented perpendicular to the axis of the fiber. Peptide interacted with the adjacent peptide and the backbone chains through complex interactions, such as hydrogen bond, thereby assembling into the beta-sheet-based polymeric fibers. Recent study demonstrated that the amyloids exhibit a hierarchical architecture with high order, which formation would undergo several times of assembling process. The beta-strand peptide firstly formed beta-sheet with several blocks, and the protofilament, which means a pair of tightly packed beta-sheets, was formed through the interaction between the side chains of beta-sheets. At last, amyloid filaments were self-assembled from protofilaments and facilitated the formation of fibrils along the axis of amyloid fibrils. Typically, the distances between the neighbored peptides in a beta-sheet and the paired beta-sheets in protofilament were 4.6–4.8 and 5–12 Å, respectively. The final formed supramolecular assemblies are wide from 5 to 15 nm with a few micrometers in length. It was found that the formation of amyloid fibrils were mediated by various interactions covering hydrogen bond, van der Waals interactions, π-π interaction, hydrophobic interactions, dipole-dipole interaction, and coordination interactions. 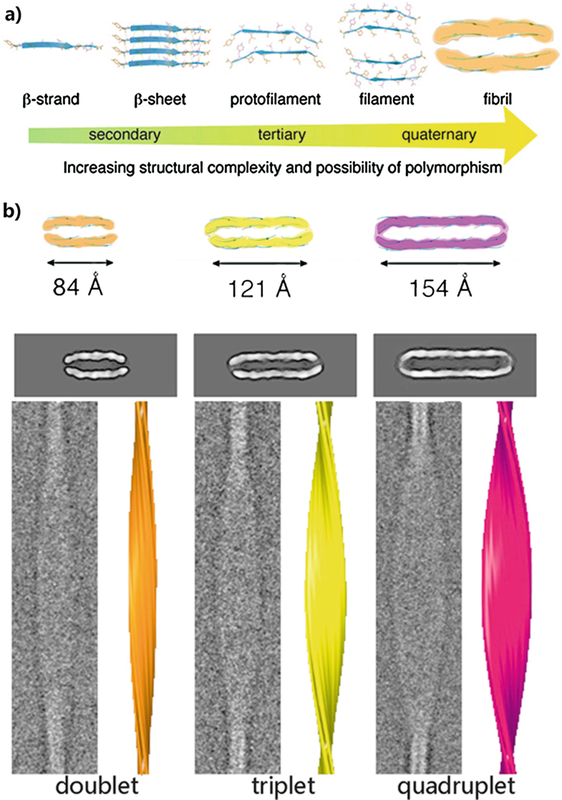 People also found that there is coexistence of various polymorphs with differing numbers of filaments, revealing a property of supramolecular polymers (Fig. 3) . The assembling of amyloid fibrils underwent a nucleation-growth mechanism. In detail, because of nonspecific oligomerization of peptides or misfolded proteins, the pre-fibrillar aggregates were transiently formed as a nucleation. Subsequently, it would “recruit” soluble proteins and peptides at the ends of fibril result in the elongation of amyloids. As a self-assembly, long amyloid fibrils can be completely generated from minutes to several weeks depending on the block sequence and incubation conditions. Although amyloids can be assembled reversibly in theory, however, within the general temperature, pH, and concentration range, formation of amyloids was mostly irreversible because of the high kinetic barriers and/or large thermodynamic driving forces during the self-polymerization process. Actually, some amyloids were unusually stable in morphology and architecture under the wide range ionic strength, temperature, pH, and mechanical stress and were even tolerant with proteolysis . Besides its stability, the amyloid fibrils explored remarkable mechanical traits. Due to the robust structure and multiple hydrogen bonds along fibrils, amyloids displayed highly mechanical strength with Young’s moduli from 0.1 up to 20 GPa. Meanwhile, the interaction between acid side chains of peptides and fibers thereby influences their bending rigidity . The excellent mechanical properties reveal the amyloid fibrils as promising biomaterials. Recently, the aspects such as synthesis artificial amyloid fibrils and functionalization of amyloid fibrils were fast growing; the amyloid-based materials were attractive because not only of its fascinating stability and mechanical properties but also its biocompatibility and highly ordered structure. Inspired by its assembling mechanism, people have reported various artificial fibrils and hydrogels, which were wildly applied in biocompatible materials for cell adhesion/culture, drug release, and gene transfer. The amyloid fibrils were also compelling templates for construction of metal and semiconductor nanostructures. What is more, with certain electrical conductivity and bio-microenvironments, it demonstrated an excellent scaffold for high-density load of luminescence molecules or metalloporphyrins to produce biocompatible photonic antennae or catalytic nanozyme. The examples above suggested great promise for developing in broad application such as biocompatible materials, energy generation, gas capture, electronic devices, sensor, and artificial enzyme . Another important aim for researching amyloid fibrils is to understand the mechanism of neurodegenerative diseases caused by misfolding protein-based amyloid and how to relieve or avoid them. Based on the formation of amyloid fibrils in Alzheimer’s disease, Qu and co-workers synthesize a polyoxometalate (POM) for inhibiting Aβ aggregation of amyloid peptides . They also found that the transition metal-doped POM demonstrated better specific recognition for Aβ aggregation and repressed the oxidase ability of Aβ-hemin complex, exhibiting a better therapeutic effect. Better understanding of amyloid fibrils would provide people more idea for neurodegenerative diseases treatments. As ubiquitous iron storage protein cages existed in many species, ferritin consists of conserved 24 protein subunits with 4 long ɑ-helices (helices A, B, C, and D) and 1 short ɑ-helix (helix E). The subunits are assembled into a spherical structure with 4-3-2 symmetry. The assembled ferritin demonstrated 12 nm spherical cage in diameter with an 8 nm hollow capacity and 2 nm thickness shell. In eukaryotes, ferritin is self-assembled with two or three kinds of subunits. The highly homologous subunits (L, M, and H) were named by their molecular weight: “Light” 20 kDa, “Middle” 21 kDa, and “Heavy” 22.8 kDa. In different species, the various homologous subunits underwent different functions; in eukaryotic cells, only H and M subunits could catalyze the oxidization of Fe(II), while in bacteria, each subunit of ferritin has the catalytic ability . It has been found that the ability of Fe(III) stored in the cavity of ferritin could decline oxidative stress and diseases such as Parkinson’s/Alzheimer’s disease and acquired immunodeficiency syndrome (AIDS). People have also found that the H-type ferritin demonstrated better association with cancer cells through TfR1-mediated binding, revealing further application such as tumor imaging or target delivery . During the self-assembling of ferritin and bacterioferritin, there were three kinds of symmetry (two-, three-, and fourfold symmetry) axis in the ferritin cage, and as we mention above, the assembly of the 24-meric shell occurred with 4-3-2 symmetry spontaneously. Studies initially revealed that the subunits of ferritin could self-assemble into oligomer along its symmetry axis and subsequently form the 24-meric protein cage. Sedimentation velocity centrifugation and circular dichroism spectroscopy indicated that the dimeric form is remarkably stable; fluorescence spectroscopy suggested that trimers and tetramers were also formed and stable. However, the assembling efficiency for distinguishing oligomers was different: The dimer- or trimeric aggregates form 24-meric assembly with more than 80% efficiency, while tetramers alone could not assemble into cage efficiently . Although either dimers or trimers are observed stable and can self-assemble into 24-mer, recent studies using alanine-scanning mutagenesis and reverse metal-templated interface redesign (rMeTIR) strategies declared that only dimers are the initial intermediate in the self-assembling process. In the formation of dimeric oligomer, the loop of one subunit between helices B and C interacts with that of another at twofold symmetry, and amino acid residues of this loop thus affect the self-assembly process remarkably. Mutation or deletion of amino acids at the loops would decline the stability or even abolished the formation of ferritin cage. Further evidence provided that the electrostatic interaction between the loops of two subunits at twofold symmetry played a significant role in self-assembling and stabilizing the dimers . Once the dimers were formed, 2-, 3-, or 4-dimer aggregates were self-assembled via the interactions between subunits and together resulted in the generation of 24-meric ferritin (Fig. 4a). This subsequent process is rapid that, as soon as dimeric intermediates were formed, further self-assembly would take place and promote the formation of the protein cages. Notably, free Fe (II) would transfer an electron to molecular oxygen, resulting the reactive oxygen species (ROS) and Fe (III). Extra ROS usually damage cellular components, and Fe (III) may be precipitated as Fe (III) oxide species under physiological conditions (solubility 10–10 M), both of which were harmful for cells. Therefore, the most important effect of ferritin in cell is storage and release of redox iron to precisely control intracellular concentration of free Fe (II) and Fe (III), providing suitable oxygenic environment which organisms required for undergoing their function well . During the iron storage, Fe (II) were first oxidized at the ferroxidase sites in ferritin and the Fe (III) stored in the inner core. Three metal ion binding sites participate this process: two sites in the middle formed the dinuclear-metallic ferroxidase center, while the third metal ion binding site which is located close to the inner surface and ferroxidase center acted as a gateway for the ferroxidase center. The oxidation of Fe (II) is mediated by the pH value because the pH affects the Fe (II) binding with ferroxidase center significantly. Taking HuFn as example, when pH was 6.5, affinity between Fe (II) and ferroxidase center of HuFn is diminished . This pH-effected Fe (II) binding is possibly due to the coordination environment of histidine at ferroxidase center sites (Fig. 4b). The easy preparation, outstanding stability, and immunized properties applied the ferritin a promising material such as drug delivery and biocatalysis. Inspired by its uniform protein cavity, the ferritin was used to synthesize nanoparticles with narrow distribution. The result hybrid demonstrated higher cellular uptaking efficiency and lower toxicity in the blood. Notably, nanoparticles were synthesized via two main methods, reduction of metal iron in its inner cavity or directly reassembling ferritin subunits around the nanoparticles or molecules for encapsulation. People have reported some works preparing Pd nanoparticles and Au/Pd nanoparticles by reduction of metal iron in the ferritin, which were used for oxidation of alcohols and hydrogenation of olefins, respectively. Other catalytic metal nanoparticles such as Ag and Au NPs were also synthesized via this strategy . Small molecules such as doxorubicin and gadolinium chelates could be encapsulated inside ferritin through another method, the pH-mediated ferritin disassociation and resembling. In this process the ferritin cage would be disassociated when pH is below 2 and reassembling via increasing pH back to 7 . The doxorubicin- and gadolinium chelate-loaded ferritin was used for killing tumor and NMR imaging. Meanwhile, modification of residues in-/outside of ferritin or fusing protein components suggests some novel technological applications. Recent study reported an enhanced vaccine with multivalent effect by fusing virus surface glycoprotein antigen to the N terminus of ferritin. Compared with traditional virus vaccine, the multivalent vaccine demonstrated more potent immune response . This strategy was also used to obtain nanozyme with high density of enzyme, thus improving the catalytic activity dramatically. Moreover, the study of construction of functional materials based on assembling of polymer-modified ferritin or changed ferritin cages has also been growing in decades; we would introduce some works in later chapters. The natural protein assemblies seem a gigantic database of species on earth; the compelling structure and fascinating functions come from the natural process of evolution. The natural assembly-based materials have been applicable in many aspects such as electronic devices, sensors, medicine, and bio-functioned surfaces. The behavioral, structural, and functional properties of natural assemblies could own to the prepared materials with excellent abilities. Moreover, genetic and synthetic modifications to natural assemblies also demonstrated attractiveness because the artificial changes could improve the properties of the natural backbone on purpose. Therefore, understanding of natural protein assemblies and combination with modification and synthetic alterations provide highly interesting strategy for construction of novel material. In another approach, people have been trying to construct the artificial protein assemblies and materials by using “supramolecular interactions” as driven force. The structural and functional design could be realized in this bottom-up strategy which can meet the specific requirement of materials better. The rapid growing of artificial protein assembly profited from the development of supramolecular chemistry since the 1990s. People could design and prepare functional materials according to the deeper understanding in the supramolecular chemistry and assembling principles of natural protein assemblies. At present, artificial protein assemblies with various dimensions and shapes such as cages, spheres, tubes, fibers, ribbons, and larger crystal arrays have been successfully realized through mediation of supramolecular interactions . Lots of supramolecular forces, such as hydrophobic interaction, Coulomb force, metal ion coordination, hydrogen bonding, pi-pi stacking, and van der Waals force, have been exploited and utilized to design and construct supramolecular assemblies. The obtained supramolecular assemblies demonstrated different properties and functions according to their individual-driven forces and different media. Meanwhile, on the amount of that, supramolecular interactions are usually reversible and adjustable; the resulting assemblies thereby exhibited some excellent traits such as facile fabrication, reversibility, reusability, self-healing, stimulus responsiveness, and self-adaptation . In decades, a large number of materials with regular morphology, self-repair, and biomimetic simulation properties have been emerging based on supramolecular interactions, highlighting the supramolecular assembly as a broad platform to fabricate functional materials and exhibiting a promising prospect. 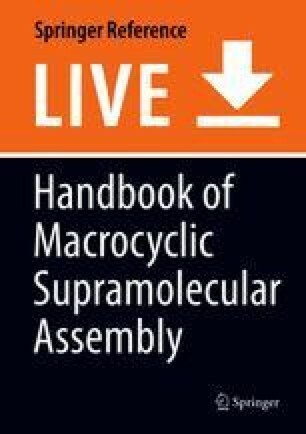 In this section, we would briefly introduce the several popular supramolecular chemical strategies for construction of artificial protein assemblies, e.g., illustrate the mechanism and properties of supramolecular interactions, and show some protein assemblies and materials with charming morphologies or functions in each field for readers. People first prepared artificial protein assemblies via using protein-protein interactions, which is inspired by natural protein assembly. The protein-protein interactions are very widespread in the biological system; many protein assemblies such as protein cages, viral capsids, actin fibers, microtubules in cells, etc. were driven via protein-protein interactions. What is more, these kinds of interactions were vital in the formation of specific tertiary or higher structural complexes from “inactive” subunits and undergo their unique functions in organisms . For example, histones, octameric protein aggregates which can bond to DNA, were assembled from four subunits (H2A, H2B, H3, and H4) via the specific protein-protein interaction and subsequently entangle DNA into chromosome. Protein-protein interaction involves various complex forces, including hydrogen bonding, electrostatic interaction, hydrophobic interaction, and so on. The multiple interactions between the surfaces of subunits induced high affinity for specific binding in complex biological system. Therefore the protein-protein interaction is always specific for construction of fine nanostructures in vitro and vivo. Initially, two natural subunits with individual symmetry were genetically fused together toconstruct nanostructures driven by affinity between subunits. The assemblies could demonstrate various morphologies by fusing different symmetrical subunits. Yeates team prior obtained zero-dimensional and one-dimensional protein nanostructures . Gradually, it has been found that the assemblies can be more varied by precisely arranging the angle of the symmetric axis between the two symmetric subunits of fusing proteins. For example, Yeates team constructed a fusing protein in which triple symmetric KDPGal protein subunits were connected with double symmetric FkpA protein subunits through an alpha helix and the rigid helix ensured the angle of two structural domains would not change due to flexibility. The angle between symmetry axis of KDPGal and FkpA was fixed in 35.3 °C. The self-assembling of KDPGal- FkpA via protein-protein interaction resulted in a highly ordered square cage . 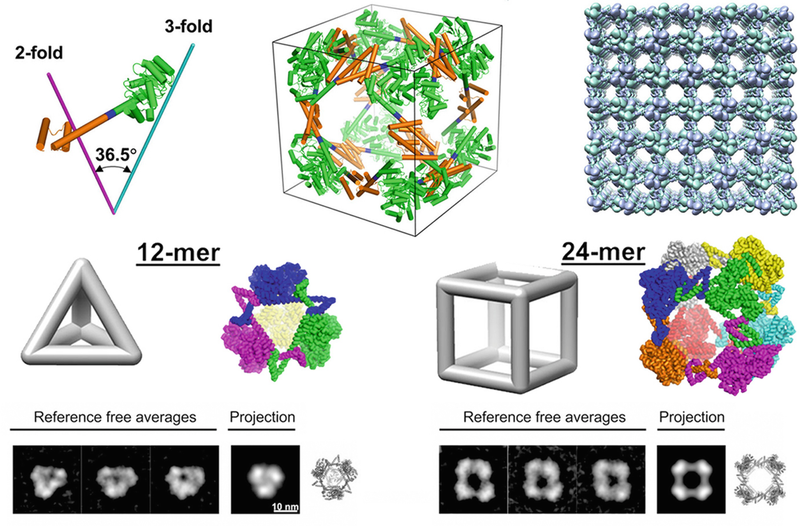 This unconventional porous protein assembly seems a promising material with potential applications such as X-ray analysis, assisted crystallization, and molecular encapsulation (Fig. 5). With the rapid development of computer technology, people have made a great progress in designing protein-protein interaction-driven assembly. In the aid of computer technology and based on the protein assembly database, people begun to study and master the similar sequence and structure information of family proteins and polypeptides. Through computer docking and simulation, scientists can de novo design and screen amino acid sequences with shape complementarity and suitable surface interactions to construct simple and multidimensional assembly of biological macromolecules. Utilizing this principle, Professor Baker’s team designed and obtained large-scale two-dimensional protein superlattices in 2015 using symmetrical Rosette molecular docking technology . At the beginning, the cyclic protein oligomers are stacked in the layer by correcting the shared symmetry axis. Then the amino acid sequences between the oligomer contact surfaces are calculated to make sure the shape complementary and the lowest surface energy. Finally, Baker et al. selected three soluble sequences, P321, P4212, and P6, which did not produce a large number of inclusion bodies during expression and could assemble in vivo or in vitro. Experiments showed that all three designed proteins can form large-scale two-dimensional protein arrays via the designed protein-protein interactions and shape complementary. This indicates that computer simulation and surface design can be used to prepare two-dimensional protein lattices, and a feasible strategy for computer simulation and design of other advanced structures is proposed. Baker’s team also reported the preparation of protein assemblies of viral capsids using computer docking technology. The method is similar to the previous description. The difference is that the symmetric axes of triple symmetric oligomer proteins are not parallel, but arranged along the respective vertices of cubes or tetrahedrons to the body center. Triple symmetrical oligomeric proteins shrink to the center of the body along their respective symmetrical axes, and the surface energy designed lowest after contact. Finally, Baker et al. obtained 24 poly-(cubic symmetry, Fig. 6a) and 12 poly-(tetrahedral symmetry, Fig. 6b) nanocages similar to viral capsids [32, 33]. The result verifies the computer simulation results very well. This lays a foundation for the future lab in vitro design of protein-protein interactions to prepare fine-structured protein assemblies. As a shorter amino acid polymer than protein, peptides are abundant in nature and classified or categorized according to their sources and function. Peptides were interesting to scientist because of several reasons in molecular biology. (1) Peptides have certain immunogenicity; the respect peptide could allow people to create peptide antibodies without purifying interested protein. (2) The synthesis, identification, and sequencing are facile via instrumental equipment such as peptide synthesizer or mass spectrometry. (3) Peptides show as regulator in clinical research and treatment. Some peptides have been provided to inhibit cancer proteins and other diseases by binding to cell receptor. (4) As structural and functional segments/tags of protein, peptides have recently been used in the study of protein structure and function. Scientists utilize the peptides as probe to research and disassociate protein complexes. The polypeptide is more simple and stable than protein; some peptides have their own second structures (e.g., alpha helix, beta folding), functions, and specific binding ability; and sequence and secondary structure of peptides have important effects on the stability and geometric structure of the assembly. In decades, many peptide assemblies, for example, fibers, nanocages, lamellae, and so on, have been successively reported , which inspired people that the polypeptide-specific binding can be used to produce protein assemblies. In recent years, people have a deeper understanding of the coiled-coil sequence and its corresponding structure. The aggregation state of coiled-coil oligomers (e.g., 2, 3, 4, 6, 7), assembled orientation (parallel and antiparallel), and surface charge distribution can be controlled by designing the coiled-coil sequence. Many researches have proved that the coiled coil can drive the generation of large-sized superstructures. For example, in 2012, Professor Woolfson’s team reported a large-sized fiber (Fig. 7a) assembled from designed coiled coil from scratch. A pair of parallel, dimerized coiled-coil peptides consisting of four alpha hepta-repeat helices (28 amino acids) was designed based on coiled-coil principles as we mention in the last paragraph. The two coiled-coil peptides could be combined at the prior two alpha helical structures from N-terminal, while the two hepta-repeat sequences at C-terminal are exposed as a “sticky” end for further assembling. Adjacent sticky ends of coiled coils are assembled via tail-to-tail connection and mediated the formation of fibers. The alpha superhelical fibers are intertwined in parallel, forming larger and longer nanofibers . Therefore, coiled coil can be used as a controllable peptide for precisely controlled assembling by arranging their sequences. Besides for preparing polypeptide fibers, coiled coil can also be used to construct more fine structures such as nanocages, 2D layer, large nanocages, and vesicles through precise sequence design. For example, the Jerala group reported the tetrahedron cages  based on coiled-coil assembling. They synthesized a series of polypeptide containing 12 coiled-coil segments, between which were linked by a flexible Ser-Gly-Pro-Gly polypeptide. By matching different coiled-coil sequences and combining direction and arrangement, the polypeptide can be self-assembled into tetrahedral nanocages through specific match of the coiled-coil pairs. At the same time, Jerala et al. found that when designing the sequence of coiled-coil sequences, uniform curvature arrangement is conducive to a good pairing of polypeptides and a tight and stable structure. Woolfson and co-workers used coiled coil to prepare hollow nanocage . Two types of coiled coils, a triple symmetric CC-Tri and a double symmetric CC-Di, were covalently linked together through cysteine. The linked polypeptides were first assembled into oligomers via CC-Tri, and then the oligomers were subsequently assembled into cages through CC-Di interaction with a size of about 100 nm. By fusing the CC-Tri to N- or C-terminals of proteins, such as GFP protein or functional groups, protein can be assembled in the external surface or cavity of nanocage via CC-Tri and CC-Di twisting, producing nanocage with functional groups or immune response enhanced vaccine because of multivalent effect. 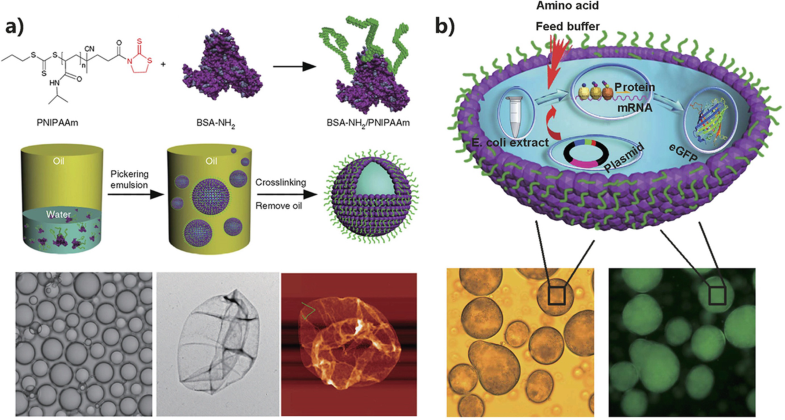 This proved that nanocage can be used for modular encapsulation or external attachment of proteins with various functions, providing an approach in synthesizing nanoreactors or external antigen proteins to synthesize vaccines (Fig. 7b) by immobilizing cascade enzymes. It shows its rich prospects in biomedicine. In addition to the rich nanostructures formed by coiled coil itself, coiled coil has also been applied in various aspects, such as assistant protein recognition or oligomer formation, protein or macromolecule immobilization, polymer gelation, vesicle fusion, etc. At first, people used natural coiled coil to make heterologous dimerization of different functional proteins. With the gradual understanding of coiled coil, people began to design coiled coil from scratch to meet the requirements. Brodsky et al. designed a trimeric coiled-coil sequence, which can be linked to the C- or N-terminal to effectively facilitate the assembly and rapid folding of recombinant bacterial collagen . Coiled coil could also be modified onto PEG chain, and gel was prepared by coiled-coil interaction. Ghosh et al. reported using coiled coil as a linker. They attached the self-suppressed coiled-coil A–B with cleavage sites and the coiled coil B alone to the N and C parts of the luciferase (FLuc), respectively. Because of the splitting of the FLuc enzyme into two parts, it did not have enzymatic activity at this time. When the protease sheared the tobacco etch virus (TEV)-protease cleavage site of NFLuc coiled coil A–TEV-B, the formed NFLuc coiled coil A could recruit the CFLuc coiled coil B, enabling two parts to combine and perform luciferase catalytic capacity . This work demonstrates the application of coiled coil in the formation of functional complexes, and the formation of vesicles has application prospects in drug transport and release. Coulomb force often refers to the interaction between changed substances, which is usually very strong and closely related to the polarity of the medium. As a medium for most protein assemblies, water is highly polar and can directly interact with changed groups, shielding the static electricity of changed moieties and remarkably weakening the attraction between charged substances. Besides medium, other conditions such as salt concentration also effected the stability of Coulomb interaction. Therefore, in order to obtain protein assembly mediated via Coulomb interaction in aqueous solutions, constructing of multivalent charges in substances or molecules for enhancing interaction and arranging charged groups in hydrophobic microenvironments to prevent the shielding effect of water molecules seem good strategies . Various protein assemblies and functional material have been reported in decades, revealing that Coulomb interaction is a powerful method of construction protein assembly. Professor Liu’s team has prepared a series of protein assemblies with regular morphology and corresponding functions by using electrostatic interaction as the driving force and multiple negatively charged stable protein 1 (SP1) as the building block. SP1 protein is a ring-shaped protein composed of 12 subunits with a diameter of 10 nm and a thickness of 5 nm. It demonstrated strong electronegativity when its pH is greater than 5. Its negatively charged amino acids mainly distribute on the upper and lower surfaces of the protein ring. The abundant and symmetrical electrostatic distribution makes SP1 very suitable for electrostatic assembly. In 2014, Liu et al. first reported the work of fabricating an artificial photovoltaic antenna by electrostatic interaction between a positively charged CdTe quantum dot and SP1 . Negatively charged SP1 and mercaptoethylamine-protected CdTe quantum dots form a regular nanowire structures through multivalent positive and negative charge attraction and shape matching. The system also provides compelling properties in photoelectric field, which owes to the presentation of quantum dots. When donor-acceptor pairs quantum dots with different size are assembled with SP1, fine order nanowires were formed (Fig. 8a). Due to the distance between donor-acceptor pairs, quantum dots were very short in the protein assemblies, and the energy of the donor quantum dots can be successfully transferred to the acceptor ones through FRET effect. The nanowires thereby demonstrated as an artificial photovoltaic antenna. Further research shows that the nanostructure changes with the participation of different sizes of quantum dots. Liu et al. obtained regular monodisperse nanowires, bundles of nanowires, and branched nanowires with the increase of the size of quantum dots. This is due to the fact that larger quantum dots can still expose a certain surface area after binding two SP1 proteins, which enables them to generate electrostatic interaction with other SP1 proteins or assemblies, resulting in bundles and branching. The facile protein assemblies seem a good platform for construction of protein functional materials. Based on the efficient electrostatic force-mediated assembling strategy of prior work, replacing positive quantum dots with dendrimers modified with SOD functional groups and using Se-modified SP1 as the building blocks, Professor Liu’s team successfully obtained protein nanowires which have the synergistic antioxidant function of double enzymes . As the fifth-generation dendrimer of polyamide ammonia (PD5), the multiple amino groups on surface ensure PD5, a strong positively charged sphere with uniform size. Liu et al. covalently modified manganese porphyrins on PD5 (MnPD5), endowing MnPD5 the catalytic ability of SOD. Se-substituted SP1 (SeSP1) have been reported demonstrating natural GPx activity. Meanwhile, the diameter of MnPD5 is about 5.3 nm, which matches the size of SeSP1 (10 nm). The research shows that the obtained MnPD5-SeSPS1 nanowires have both activities of SOD and GPx. The two enzymes can synergistically and effectively reduce the damage such as mitochondrial swelling and lipid peroxidation caused by free radicals (Fig. 8b). At the same time, the protein assembly has almost no cytotoxicity, which provides a new idea for the preparation of biocompatible anti-free radical oxidation materials. Based on the electrical interaction, regular shape and size of building blocks would obtain protein assembly with different morphologies. For example, utilizing the size-matched negatively charged cage proteins and positively charged nanosphere (nanoparticles, dendrimers, protein cages) as building blocks, protein superlattices were formed via electrostatic interaction. Precise control of charge distribution and salt concentration can also construction of protein superlattices or crystals with complex components. 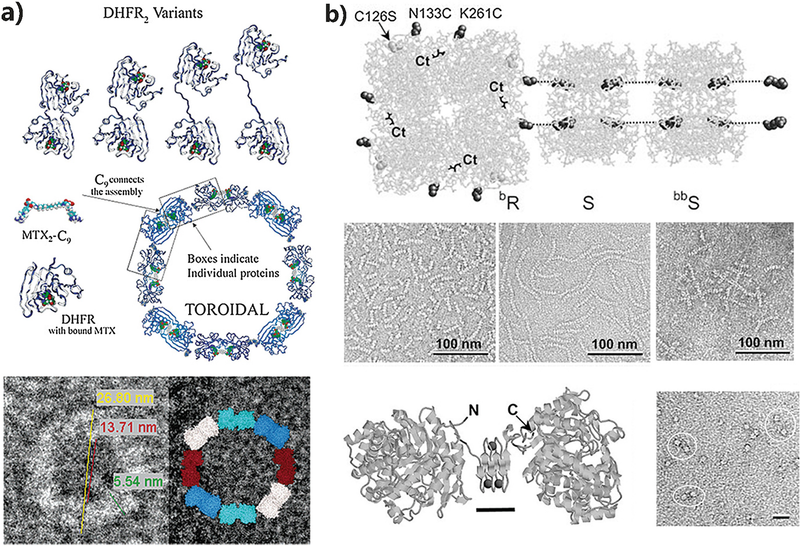 In 2018, Kostiainen’s team reported the superlattice structure formed by the electrostatic interaction of two protein cages and polypeptides or proteins with positive charge . CCMV and ferritin proteins are natural protein cages with uniform size and high-surface negatively charged density, which can be used as good assembly units. Kostiainen et al. demonstrated that the negatively charged ferritin protein, CCMV virus protein cage, and cationic polypeptide (K72) or K27 fused green fluorescent protein recombinant (GFP-K72) could self-assemble into highly ordered eutectic structure in aqueous solution. The morphology and size are controlled by the ratio of opposite charge components and electrolyte concentration. In this lattice/crystal system, ferritin and CCMV were negatively charged, and the polypeptide is a cationic structural component, which is necessary for assembling. What is more, cationic polypeptide could bring functional macromolecular GFP into the co-crystal through cationic polypeptide fusing. The size of ferritin and CCMV was 14 and 28.5 nm, respectively, and the cationic recombinant proteins were tripped in the gap between the cages (Fig. 9). This ordered porous structure has its promising prospects; the tripped crystal can be used as a shield and protective agent for proteins; meanwhile, co-crystal structure could help to determine the structure of biological molecules by X-ray scattering. The metal ion coordination was defined as metal complex consisting of metallic coordination center and surrounding bound molecules named as ligands or complexing agents. The ligands bonded to the center atom (metal ion) via coordinate covalent bond which the ligand atom donates lone electron pair electrons to the empty orbital of metal ions. Thus the metal ion coordination is a stable interaction. The metal ions can bond with ligands with different coordination number according to self-regulation of size, charge, and electron distribution of the metal ions and the ligands. Meanwhile, most metal-ligand complex forms ordered geometric structures followed the points-on-a-sphere pattern; in this principle, the geometries were regulated through orbital overlap and ligand-ligand repulsions. There were several spatial arrangements of coordination geometries, which were summarized as linear for two-coordination, trigonal planar for three-coordination, tetrahedral/square planar for four-coordination, trigonal bipyramidal/square pyramidal for five-coordination, octahedral (orthogonal) for six-coordination, pentagonal bipyramidal/capped octahedral/capped trigonal prismatic for seven-coordination, square antiprismatic/odecahedral/bicapped trigonal prismatic for eight-coordination, and tricapped trigonal prismatic/capped square antiprismatic for nine-coordination. The various geometries provided the multiforms of assemblies driven by this interaction. The metal coordination could be reversibly destroyed by chelating agents. It was also worth noting that, depending on the conditions, different dynamic, cis-trans, facial-meridional, and optical isomers could formed based on this reversible interaction and demonstrate quite distinct properties . According to the above traits, in decades, scientists have used the metal ion coordination to produce supramolecular assemblies, in which the protein assemblies occupy a certain proportion. People begin to demonstrate attention to metal coordination for protein assembly because metal ion complexes are very common in biological systems. Many enzymes are activated by catalytic metals. In nature, the metal complexes also play an important role in stabilizing protein subunits and protein structures and participate in protein recognition, signal transduction, neurological diseases, and cell apoptosis . Recent studies found that the metal coordination could induce aggregation of Aβ peptides, which were stable and caused neurodegenerative diseases such as Alzheimer’s disease. Therefore, the metal ion coordination is an excellent driving force for inducing supramolecular assemblies. At present, small molecular oligomers, metal-organic frameworks, and even highly ordered protein assemblies driven by metal ions have been continuously explored and developed. What is more, corresponding assemblies have also been reported in applications such as catalytic production, gas adsorption, separation and storage, new energy sources and biomedicine, etc. revealing the metal coordination a powerful tool for construction of fine structures and functional materials. Due to its strong force, reversibility, and special spatial structure, metal ion coordination has been proved not only to construct compelling assemblies based on small molecules but also a flexible strategy to induce high-order nanostructures of biological macromolecules, such as proteins. In natural protein system, amino acids such as histidine (His), cysteine (Cys), aspartic acid (Asp), and glutamic acid (Glu) demonstrated good affinity to cooperate with metal ions, so they are often used as bonding sites for metal ion-specific coordination. Tezcan et al. first reported a stable oligomer formed by mutant cytochrome c upon zinc ion coordination. Cytochrome cb562 (cyt cb562) is a C2-symmetric stable protein consisting of four-stranded helix, which is stable and suitable for site-directed mutation design without disrupting original structure. The mutant MBPC-1 was obtained by introducing two histidine chelating sites (His59/His63, His73/His77) by site-directed mutagenesis and used for self-assembling with metal coordination. The latter crystallographic data suggested that MBPC-1 protein can split joint with other MBPC-1 in the aid of Zn ion coordination, subsequently forming a stable quadruple dimer . Based on metal-chelating assembly to form oligomers, Tezcan et al. began to construct 2D and 3D protein assemblies by designing spatial location of histidine coordination sites and rearrange protein interfaces to stabilize binding between building blocks. For example, in 2012, they designed a cytochrome cb562 mutant protein, named RIDC3, for precisely assembling. RIDC3 were designed with bi-His coordination sites and protein interface docking. RIDC3 could self-assemble into 2D lattice and 3D crystals induced by coordination of zinc ion. The crystallographic data revealed that there exists an unsaturated chelating site exposed on RIDC3 after forming stable dimers, which enable further growth of RIDC3 in two directions and formed high-dimensional nanostructure . Meanwhile, the surface of RIDC3 had undergone a certain degree of mutation, which stabilizes the dimeric formation of RIDC3 upon Zn coordination and is conducive to further production of protein crystal (Fig. 10a). Tezcan et al. also found that the morphology obtained via metal mediation can be regulated by the ratio of Zn/RIDC3 and pH conditions, which is due to the different nucleation rates of assembly under different conditions. On this basis, the natural hemin cofactor in RIDC3 was replaced with photosensitizer zinc porphyrin (ZnP); the ZnP-RIDC3 also formed stable protein lattice as RIDC3 upon coordination. Because of the photoreduction of ZnP, Pt nanoparticles (Fig. 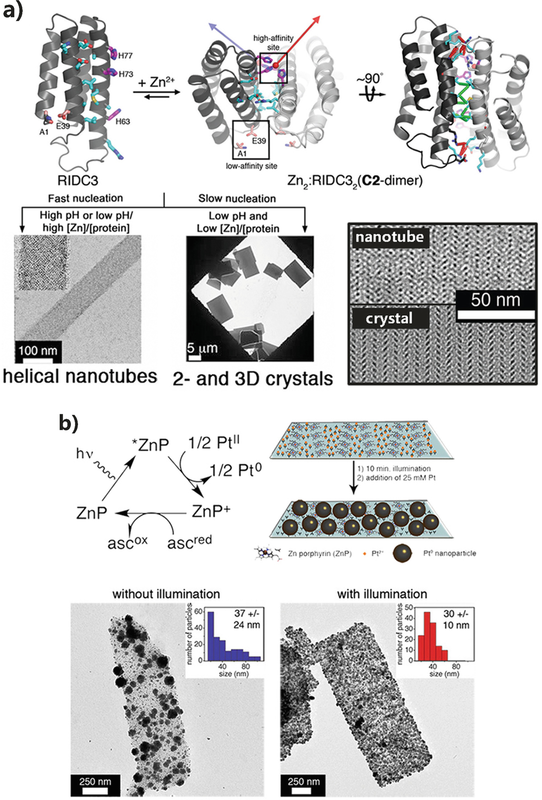 10b) were formed in situ on the two-dimensional Zn-ZnP-RIDC3 sheet after light irradiation . Besides, Zn-RIDC3 two-dimensional materials demonstrated other advantages such as fascinating thermal stability and tolerance of organic solvent. The functionalization of the protein-based material is also facile via replacement of its cofactor on purpose, providing novel idea and methods for the preparation of protein-based nano-functional materials in the future. After using metal ions as driving force to obtain stable two-dimensional nanomaterials in vitro, people explored how to use this assembly strategy to achieve in situ assemblies in vivo. In 2014, Tezcan et al. reported the in situ assembly of Zn ions in vivo. By designing the surface interactions and coordination sites on cyt cb562 protein, Tezcan et al. obtained AB3 mutant protein through site-directed mutagenesis. The AB3 was proved to form stable tetramers in vitro with addition of Zn ion as designed. Then, AB3 protein was further tried in vivo system; when expressed in bacteria and added with zinc ions, AB3 protein self-assembled in vivo and formed a tetramer with hydrolase activity . During the assembling process, four zinc saturated complexes help to stabilize the structure of the oligomers, while the other four zinc unsaturated complexes serve as catalytic sites for hydrolytic enzymes. The obtained Zn8:(A104/G57 AB3)4 could catalyze the hydrolysis of ampicillin and endowed ampicillin resistance. This work revealed metal coordination-mediated assembling seems an interesting strategy for the construction of protein functional materials in vivo. Professor Liu has devoted to utilize coordination strategies to construct highly fine nanostructures via precisely design of coordination sites and protein-protein interaction. Using C2-symmetrical spherical natural enzyme sjGST as building block, Liu and co-workers first used metal coordination to drive the formation of nanowires . By genetic engineering, His-tag (six consecutive histidines) was linked to the C-terminal of two subunits of sjGST to obtain a 2His tag-sjGST mutant protein. As the two His-tags were linearly distributed, His tag-sjGST would assemble along the line to form protein nanowires upon coordination of metal Ni ions (Fig. 11a). On this work, Liu’s team attempted to explore more sophisticated structures which can be obtained by well controlling the growth direction of assembly. For this purpose, Liu et al. designed two pairs of metal ion coordination sites on sjGST protein with the help of computer and obtained 2His-GST mutant protein. The two designed sites had a fixed angle in direction, which enabled the growth of 2His-GST with a certain radian under the coordination of metal ion; and thereby formed an accurate nanoring structure ultimately (Fig. 11b) . Besides the metal coordination interaction could induce the precisely assembling, computer docking simulation of protein surface confirmed that the interactions between two 2His-GST surfaces also participated in this controlled assembling process. This interaction stabilizes the relative positions between the two 2His-GSTs and promotes the specific coordination of metal ions with the designed histidine sites. In addition, due to the protein surface interactions could be affected by ionic strength, Liu et al. found that the diameter of 2His-GST nanorings could be adjusted by regulating the concentration of salt. 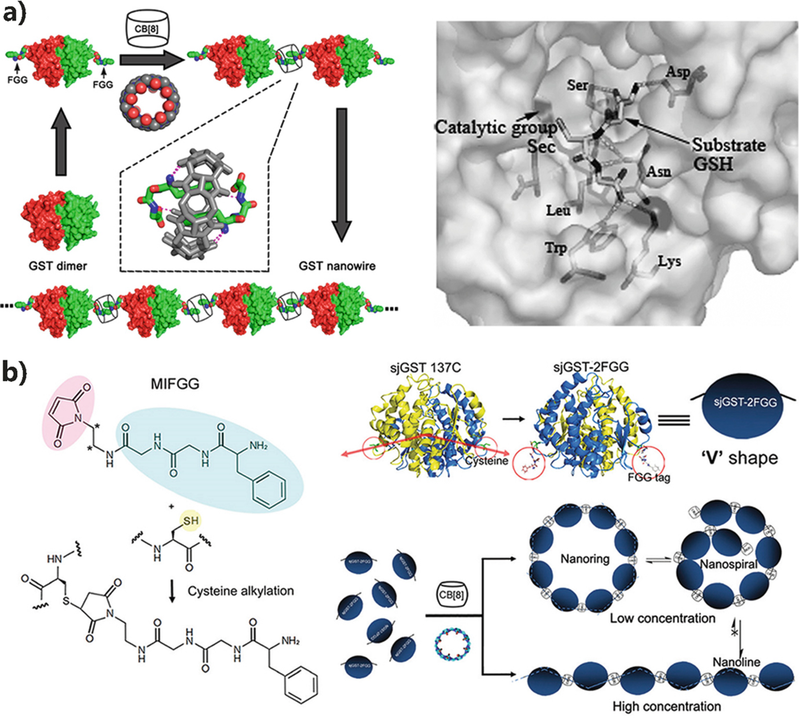 The sjGST monomer displays activity of glutathione S-transferase, and the protein nanoring thus had the potential as nanozyme. This work provides an inspiration for the preparation of more elaborate protein assemblies, revealing the metal coordination interaction as a promising supramolecular interaction to construct precisely nanostructure and functional materials. The concept of host-guest (HG) system begins with the discovery of acupoint ethers and crown ethers by Lehn, Cram, and Pedersen et al. and developed to a branch of supramolecular chemistry. Nowadays, host-guest was defined as complexes that consist of two or more molecules/ions that are aggregated together via molecular recognition and noncovalent interactions such as hydrogen bonds, ionic bonds, van der Waals forces, and hydrophobic interactions. The affinity between guest and host is always highly specific because of the specific noncovalent interactions, for instance, hydrogen bonds, thereby leading to molecular recognition, which demonstrates a promising strategy for construction of precisely assemblies. In the last two decades, macrocyclic molecules, such as crown ethers, cyclodextrins, and cucurbit[n]urils, have been synthesized in succession and investigated as host to drive or regular supramolecular assembling. Based on the specific recognition and inspiration of ordered supramolecular assemblies, host-guest interactions attracted much attentions of scientists and were investigated to construct synergistic and highly ordered protein assemblies. Among the macrocyclic molecules, cone-shaped cyclodextrins and pumpkin-shaped cucurbit[n]urils demonstrate great advantages when applied in water and biological system because of their aqueous solubility and high specificity, which seems a fascinating platform for guiding protein assembling . In this section, we would briefly introduce several examples of protein assemblies induced by host-guest interactions. Brunsveld and co-workers first reported a work for dimerization of fluorescence protein via β-cyclodextrin (β-CD) and lithocholic acids (LAs). With cooperation of strong host-guest interaction and innate noncovalent interactions between dCFP and dYFP, stable heterodimers could have been formed by β-CD and LA interactions and protein interaction with high affinity (Kd = 4×10−7 M). Meanwhile, due to the dimerization and overlap between excitation and emission of dCFP and dYFP, the heterodimer demonstrated a good efficiency of FRET. This work inspired a development of biosensors through host-guest interaction with enhanced sensitivity via stabilizing the heterodimer . As a new-generation host molecule, cucurbit[n]urils have drawn lot of interests and been applied in assembling and functionalization once synthesized. By changing the numbers of glycoluril units, cucurbit[n]urils could specifically recognize guest molecular with various sizes through geometrical fitting and hydrophobic and ion-dipole interactions. Based on this idea, cucurbiturils (CB), as a versatile molecular recognition host which can drive aggregation of ternary complexes with guest molecules in aqueous solution, demonstrated an alternative strategy to mediate protein self-assembly and specific visualization of the protein dimerization. CB can specifically capsule various guest pairs such as methyl viologen (MV)-naphthalene (Np) and methyl viologen (MV)-trans-azobenzene (trans-azo). Among thesis guest pairs, motifs consisting of two tripeptide phenylalanine-glycine-glycine (FGG) were suitable for application in protein system because of its high affinity (K = 1.5 × 1011 M−2) and facile modification on protein N-termini through molecular biology technology. Brunsveld and co-workers thus investigated the dimerization of FGG-mCFP and FGG-mYFP guided by CB . With the titration of CB into a FGG-mYFP solution, a decline in fluorescence intensity suggested the occurrence of homo-FRET caused by typical supramolecular recognition process between CB and FGG-mYFP. Size-exclusion chromatography (SEC) measurements demonstrated the high stability of formed protein dimer, which can endure high dilution. Heterodimerization between FGG-mCFP and FGG-mYFP can also be formed via high selective binding between CB and FGG motifs, which was monitored by fluorescence analysis showing an increase of the peak ratio at 527/475 nm from 0.46 to 2.73. It is worth noting that despite the high stability of the binding pair, the heterodimerization of FGG-mCFP and FGG-mYFP can reversibly disassociate via adding competing guest methyl viologen molecules. The reversible heterodimerization and FRET suggested a great bioorthogonal approach for further biosensor of methyl viologen molecules. Meanwhile, a tetrameric complex of FGG-dYFPs and FGG-dCFPs was also formed via stable CB-FGG-based host-guest interactions and designed intrinsic interactions between FGG-dYFPs and FGG-dCFPs. 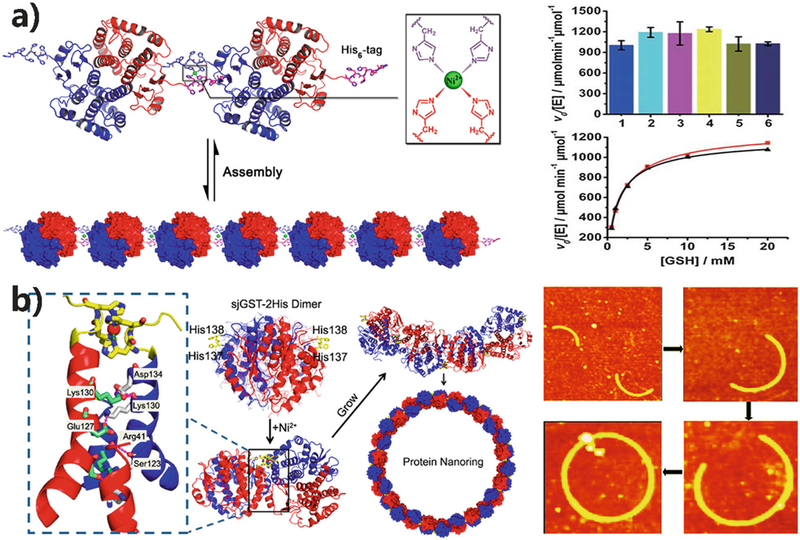 Liu and co-workers prior reported the work that construction of protein assemblies with large-scale and fascinating activity functions . Two FGG tripeptides were genetically fused onto the N-terminals of glutathione S-transferases (GST) homodimer and located in linear direction. With addition of CB, two FGG tripeptides from two individual protein were recognized and specifically bonded to CB, generating a stable ternary complex. As a result, the GST variants (FGG-GSTs) could assemble into 1D linear nanowires via CB-FGG host-guest interactions (Fig. 12a). The linear morphology of the 1D nanowires were characterized by AFM with an average height of 4.8 ± 0.3 nm, which was corresponding to the theoretical crystallographic data of GST. Isothermal titration calorimetry (ITC) was employed on this system to investigate the binding ratio and constants. The ITC results demonstrated that FGG-GST interacted with CB in a ratio of 2:1 and with a higher binding constant than FGG molecules and CB, revealing that the protein nanowires were facilitated via FGG-CB combination. When using the glutathione peroxidase (GPx) mimic FGG-GST as monomer, which have been reported by Liu and co-workers and shown remarkable GPx activity, a GPx functionalized protein nanowires could also been obtained by addition of CB. The resulting functional protein material demonstrates stability and significant antioxidative activities for inhibiting mitochondria damage against ROS. Moreover, Liu’s team reported the CB-FGG-mediated protein assemblies using FGG-recoverin-GST and FGG-GL5CC-I27w34f-GST as building blocks to construct stimuli-responsive biomaterials. Recoverin and GL5CC-I27w34f are Ca2+ and redox stimuli-responsive domains, respectively . With individual stimuli, two domains alter their conformations thereby affecting the morphologies of their protein assemblies driven by CB-FGG interaction. This CB-mediated host-guest interactions and functional components combined strategy could not only obtain long-scale protein nanostructures but also presents an approach for further functionalization of protein nanostructures with advanced properties. 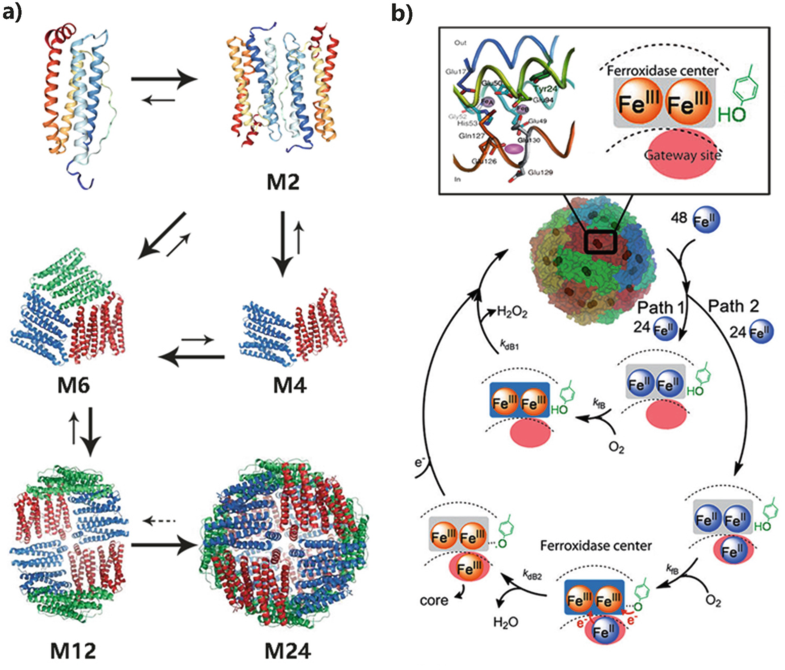 Beyond genetical fusion, Liu’s team investigated modification of the biocompatible FGG tripeptides onto the design location of protein via click chemistry of mercapto-maleimide, which is used to construct more controllable protein assembly . The maleimide-functionalized FGG was first synthesized, and GST variants were designed through point mutation, where amino acids of the location for maleimide-functionalized FGG were mutated into cysteine. The orientation of two cysteines was designed in a V shape to form an angel during the growth. The modified GST variant (sjGST-2FGG) assembled into nanorings mediated by the CB-FGG host-guest interactions. This work also found that, as a supramolecular chemistry, the morphologies of protein assemblies altered when changing their dynamic equilibrium via dialysis or addition of sjGST-2FGG monomers, which renders the equilibrium between nanorings and “gapped nanorings.” This process were investigated and monitored by AFM and TEM measurements; the CB/FGG complex could undergo a dynamic equilibrium between association and dissociation. The nanorings could cleave and associate with more free monomers, resulting in extending of nanoring from the cleaved tail (Fig. 12b). This work provided a more versatile strategy for construction of protein assembly using host-guest interaction; the modification demonstrated more maneuverable than genetically fusion, suggesting a possible direction for the construction of precisely controlled protein assembly system. Much like the specific host-guest recognitions in artificial synthesis chemistry, there were lots of proteins that could stereospecifically and reversibly recognize their selective ligands through noncovalent interactions hydrogen bonds, van der Waals forces, hydrophobic interactions, etc. This protein-ligand interaction demonstrates high specificity, reversibility, and high affinity, which reveals to be precise, smart, and stable when this fascinating interaction was utilized to guide protein assembling. In decades, inspired by the compelling natural protein-ligand interactions, people applied strategies, for example, surface modification of ligands, synthesis of various functionalized ligands, and engineer of protein with different receptor domains, to construct protein assemblies which suggested controlled architecture or functional biomaterials. In this section, we introduce some works which utilized typical protein-ligand interaction to induce protein assemblies, exhibiting that it is a promising tool for producing fine nanostructures and functional materials. The strept-biotin or avidin-biotin interactions are known for their remarkable affinities (up to ∼1015 M−1), which seems one of the strongest noncovalent interactions in nature. Besides applied on chemical modification, people attempted to construct fine structure using this stable and specific guided force. Ringler and Schulz first reported the work about protein assembly induced by avidin-biotin interactions. The tetrameric L-rhamnulose-1-phosphate aldolase (RhuA) with C4 symmetry was selected as four directional junctions. Based on this C4 architecture, three site-directed mutageneses were applied on the RhuA proteins to construct protein blocks. Among which one undesired thiol was remove (C126S), and two cysteines (N133C, K261C) were introduced onto each subunit’s surface for modification, a total of eight biotins in four directions via disulfide bonds. Meantime, STV, another D2-symmetric protein blocks for assembling, could also be labeled by biotins. The resulting biotin-labeled protein could specifically be associated with STV, which have pocket for biotin binding, based on the high affinity of STV-biotin interactions. Protein rods and network were thereby self-assembled by mixing STV and biotin-labeled STV (D2 symmetry) and RhuA (C4 symmetry) molecules as building blocks (Fig. 13b) . The length of the tethered biotin should be short enough to ensure the specific binding to the side surface of streptavidin. Moreover, a dynamic protein network with a switchable mesh can be achieved by utilizing conformational responsive proteins as spacers within the network (Fig. 13b). Notably, though the noncovalent interaction is very strong, the protein arrays were limited in small sizes, owing to the flexibility of the linker suppressing the formation of rigid network. Beyond modification of ligand molecules onto the surface of proteins, synthesis of artificial linker with multiple ligands molecules and engineer receptor protein were also promising strategy to construct protein assemblies. Using strong host-guest recognition between tetrahydrofolate reductase and methotrexate, Professor Wagner’s team reported a work that an engineered dimeric tetrahydrofolate reductase (DHFR) and synthesized bicephalic methotrexate (bis-MTX) self-assembled into protein nanostructures . The dimeric protein building block, ecDHFR2, was obtained through fusion of two dihydrofolate reductase molecules with a flexible peptide linker, and artificial ligand (bis-MTX-C9) was synthesized by addition of inhibitor molecules at two ends of linker with 9 C length. Toroid protein assembly was observed from TEM when bis-MTX was mixed with ecDHFR2. Moreover, the diameter of the nanorings could be tuned via adjusting the length of peptide linkers which affects flexibility between two intertetrahydrofolate reductase domains (Fig. 13a). The size alteration of nanorings was probably due to the distinct subtle balance between entropy and conformational dynamics when using different flexible ecDHFR2 as monomers. Wagner and co-workers also found that the catalytic efficiency of the protein nanorings was size-dependent, which reveals a way to regulate catalytic activity through precisely conformational operation. Given the receptor-ligand interaction is highly specific, cooperation of receptor-ligand interactions and other supramolecular interactions in protein assembly system would demonstrate appeal advantages than direct protein self-assembly. The designed linker for the cooperation system was synthesized with two functional sections, one fraction containing the ligand molecules recognized with protein receptor while another part undergoing a specific combination according to supramolecular interaction. The cooperation induced protein-protein associations and realized achievement of highly selective and directional assemblies without any chemical or biological modification to protein building blocks. This novel strategy provides a convenient way to construct fine nanostructures through integration of orthogonal protein-ligand interaction and additional supramolecular interactions. 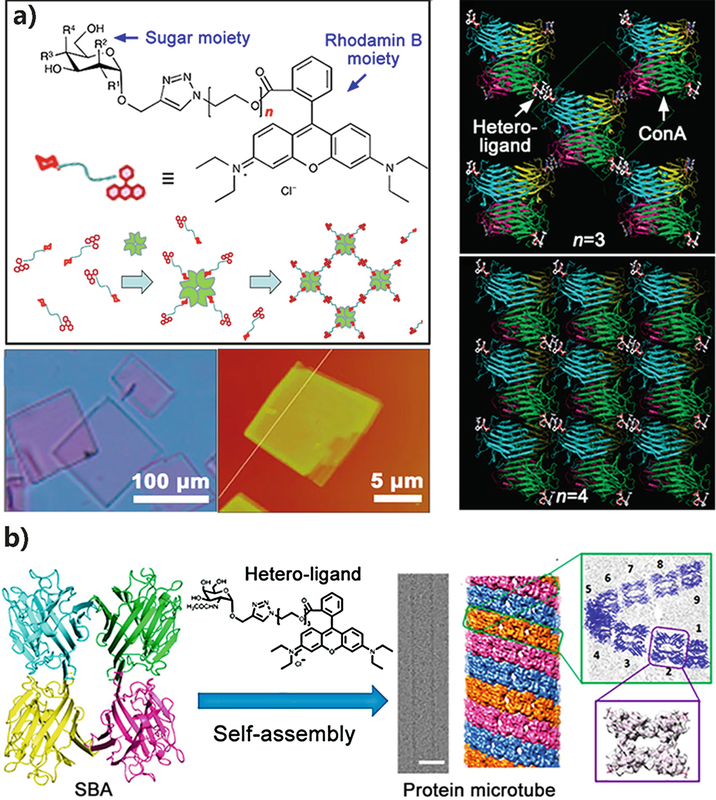 Through combination of receptor-ligand interactions and metal coordination, Ward and co-workers obtained a hierarchical protein self-assembly. A divalent linker (Biot2-terpy) with two biotins and a metal coordination group, terpyridine was designed and synthesized. This Biot2-terpy linker and ferrous ions formed a coordination complex ([Fe(Biot2-terpy)2]2+) with ratio of 2:1. When adding streptavidin to the coordination complex solution, streptavidin recognized and bind the biotin tails of complex, thereby forming one-dimensional protein assemblies . With more suitable cooperation of receptor-ligand interactions and other supramolecular interactions, people could obtain more accurate protein nanostructures. For example, Song and Jiang and their co-workers have reported 3D protein crystals and microtubes based on synergy of protein-sugar recognition, hydrophobic pi-pi dimerization of rhodamine B (RhB), and hydrogen binding. The designed linker molecules consist of a rhodamine B (RhB) and sugar components, joined by oligo(ethylene oxide) (FEG). Mixing lectin ConA proteins and designed linker, 3D protein crystals were automatically generated via dimerization of RhB and lectin-sugar recognition. Notably, according to X-ray crystallography, the steric structures and symmetry of 3D crystals can be regulated by changing the length of oligo(ethylene oxide) in designed linkers (Fig. 14a, b). The automatic formation of 3D crystals was also studied; kinetics demonstrated that crystallization proceeded via a two-stage process: sugar group of designed linker was first recognized and immediately bound to lectin ConA and subsequently, the dimerization of RhB proceeded and driven the formation of final crystals. This kinetics process ensured a rapid crystallization with high yield when protein monomers were not end-capped under excess linkers. Based on this successful cooperation strategy, they also produced precise protein microtubules via dual supramolecular interactions of soybean agglutinin (SBA)-sugar recognition and RhB pi-pi stacking . Cryo-TEM indicated that the left-handed helical microtubular structures were formed by twisting of three protofilaments, each of which has a periodic helical structure with nine SBA tetramers tethered by the designed linkers (Fig. 14b). The kinetic and assembling mechanism was similar as the above work. While new tetrameric SBA was introduced to this system instead of lectin ConA, providing a novel steric orientation and symmetry, thereby yielding the accurate protein microtubes . Interestingly, this assembling process of the microtube reproduced very well in both structural and dynamic aspects of artificial protein microtubule. Meanwhile, the protein microtubes demonstrated enhancement of immune response to macrophage cells, suggesting its further immunological applications as biomaterials. Though the origin is not fully understood, hydrophobic interactions in aqueous solution are mainly due to dominant nature of the hydrogen-bonding network that accommodates hydrophobic molecules. The hydrophobic and nonpolar molecules tend to aggregate and exhaust water molecules in aqueous, which process is traditionally considered to be entropy-driven. There exists large amount of dynamic hydrogen bonds between the liquid water molecules, forming a hydrogen-bonding network. When nonpolar region or molecules are introduced, water molecules fail to form hydrogen bonds with these nonpolar substrates. The surface of nonpolar substrates without polar water shield will disrupt the original hydrogen-bonding network between water molecules. For minimizing the disrupted hydrogen-bonding network, hydrogen binds are regulated on this surface, resulting in a water “cage” around the nonpolar substrates. However, the formation of static “cage” leads to the restricted mobility of water molecules and causes dramatic decline in translational and rotational entropy of water molecules, which process is unfavorable in entropy and Gibbs free energy. Therefore, to increase the disrupted entropy and proceed with the thermodynamic system in a more favorite way, hydrophobic and nonpolar molecules would reduce their exposed surface to minimize their disruptive effect via aggregating together and driving the self-assembling/aggregation of hydrophobic and nonpolar molecules in aqueous solution . When large hydrophobic molecular is introduced, the enthalpy reorientation plays more important role in driving aggregation as well as entropy. Therefore, hydrophobic effects are complexly depended on molecular surface area, shape, and solvent polarity. The large nonpolar surfaces always demonstrate strong hydrophobic interactions and form robust assemblies in aqueous solution. As an effective driving force in water, hydrophobic assembly strategy has also been well applied in protein-related assembly. Prior strategy to achieve protein assembly via hydrophobic interaction focuses on synthesizing a protein-polymer conjunction for assembling. Based on the protein-polymer conjunction, the stimuli-responsive polymers were bioconjugated to proteins to construct a smart platform. Typical, poly(N-isopropylacrylamide) (PNIPAM), a polymer which undergoes transformation of hydrophobicity at lower critical solution temperature (LCST), was combined to various proteins and generated a series of temperature-responsive protein nanostructure. 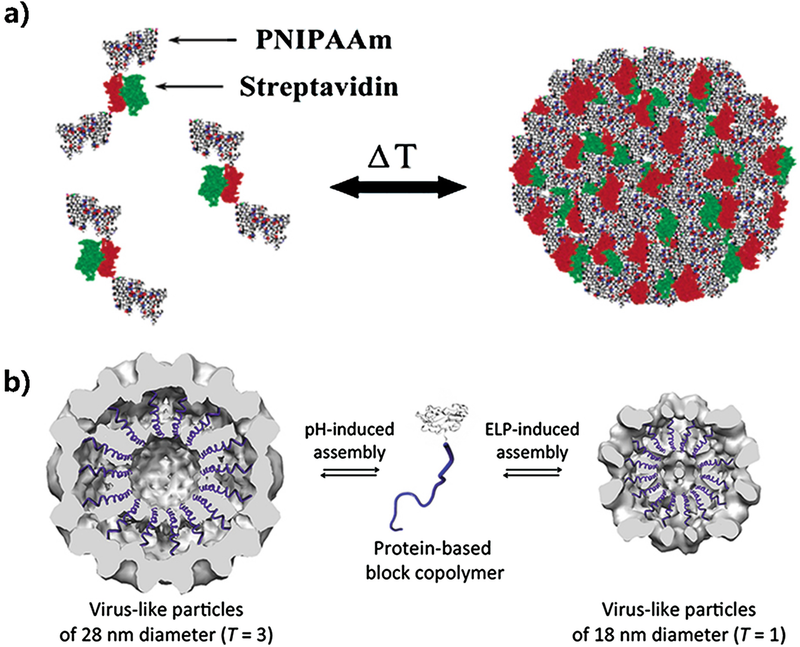 Hoffman, Stayton, and co-workers reported a reversible protein nanoparticle using streptavidin-PNIPAM conjugate as building blocks . PNIPAM is hydrophilic when temperature is below the LCST and the conjugates demonstrate soluble and free in aqueous. While above LCST, PNIPAM changes to hydrophobic, and the resulting conjugates aggregate into nanoparticles driven by the hydrophobic interaction (Fig. 15a). Besides artificial polymers like PNIPAM, natural hydrophobic fragments with stimuli response also attract people’s attention to produce protein assemblies. Elastin-like polypeptide (ELP) is a polypeptide which can switch its hydrophobicity from extended hydrophilic state to a crouched hydrophobic state with increasing temperature. Due to it is a natural polypeptide, ELP could be facilely added onto protein via genetic engineer. The resulting ELP-protein conjugates demonstrated innate biocompatibility and performed as “smart” building blocks for construction of protein assemblies via hydrophobic interactions, endowing them with wider potential for in vivo applications. Cornelissen and co-workers reported a stimuli-switched protein self-assembly system in which two distinguish assembling forms were governed by pH and temperature, respectively . First, ELP was fused to the capsid protein (CP) of cowpea chlorotic mottle viruses (CCMVs) to obtain a ELP-CP fusion protein. The resulting fused ELP-CPs can self-assemble into two kinds of well-defined nanostructures via assembling mechanisms of individual fractions: when ELP was soluble in water, the CP fraction of ELP-CPs can proceed and induced a reversible pH-dependent assembling of ELP-CPs as CCMV assembling. After generating dimers from CP, the dimeric aggregations (ELP-CP2) further assemble into relatively large virus-like particles (28 nm) at low pH (5.0) and can dissociate back into ELP-CP dimers when pH above 7.5. Meanwhile, when ELP section becomes insoluble at high temperature, ELP-CPs can also self-assemble into 18 nm nanocapsules by hydrophobic ELP moiety-mediated aggregation. According to the stimulus, the designed ELP-CPs can self-assemble into pH-induced 28 nm virus-like particles or ELP-mediated 18 nm nanocapsules (Fig. 15b), providing this platform a promising “smart” material for further in vivo application. 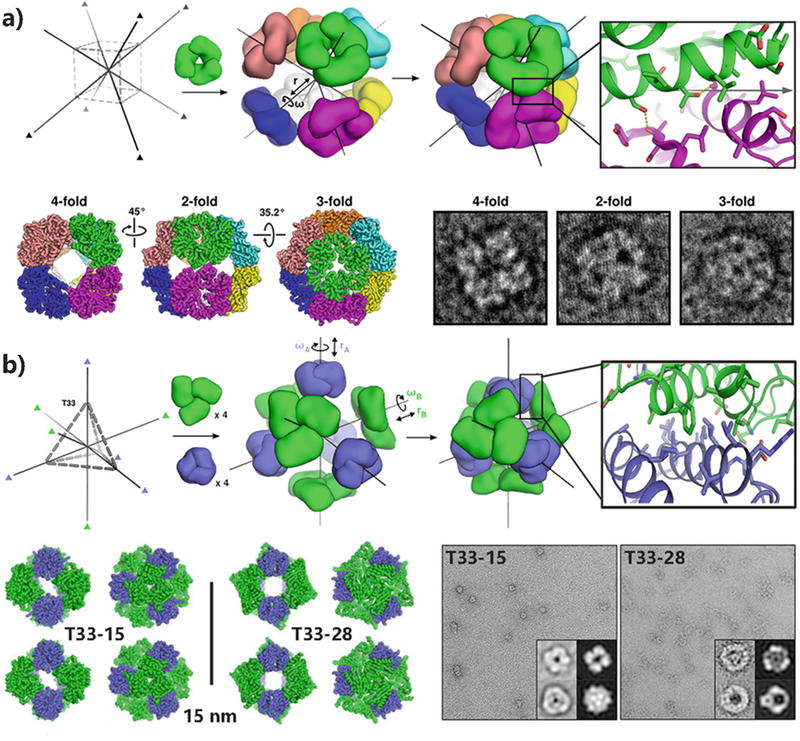 Schiller’s team designed a gene-encoded amphiphilic block fusion protein, which could assemble into a closed organelle-like capsule in vivo through hydrophobic-mediated assembling in E. coli cells . The genetic-engineered fusion proteins could modify with functional molecules through the incorporation of nonnatural amino acids. In detail, the sequences of hydrophilic block elements (E) and hydrophobic block elements (F) Schiller used are VPGEG and VPGFG, respectively. By arranging E20 block, F20 block, and single molecule green fluorescent protein (mEGFP), different assemblies were formed. Schiller and co-workers further discussed the effect of sequence on assemblies. MEGFP-E20-F20 can be well assembled into a closed cystic morphology similar to the organelle. Other arrangements of E20, F20, and mEGFP can also form thylakoids, indicating that their arrangement has little effect on assembly. Finally, the chemical functions of these organelles can be introduced by site-specific incorporation of azido-L-phenylalanine (pAzF) nonnatural amino acids. This makes it possible for the organelle-like organelles formed by polypeptide block protein units to be developed into intracellular nanoreactors. The hydrophobic “polymer” and hydrophilic protein conjunction not only can directly assemble in pure aqueous but also formed well-defined structure in the interface of two kinds of solution with large polar difference. 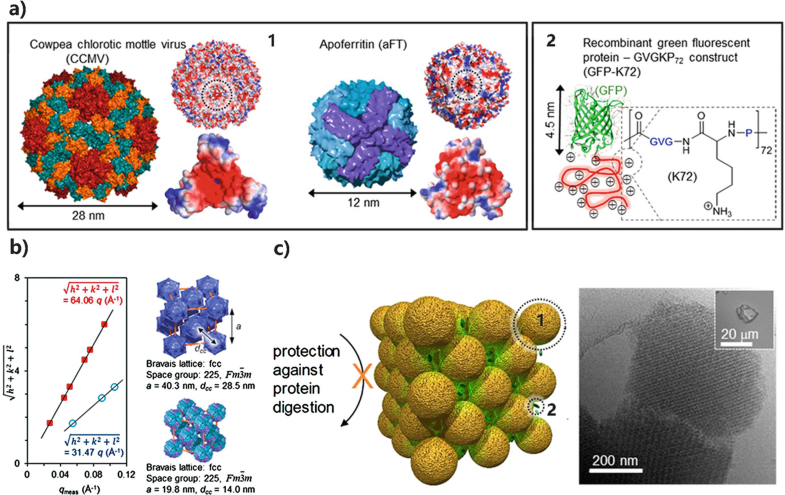 Mann and co-workers reported a general approach to prepare large microcompartments termed as proteinosomes at the oil/water interface using protein-polymer bioconjugates . First, PNIPAM polymers were linked onto bovine serum albumin (BSA) through mercaptothiazoline-amine covalent modification, forming giant amphiphilic protein-polymer bioconjugates (Fig. 16a). Because protein and PNIPAM suggest fine solubility in water and oil solution, respectively, the resulting BSA-PNIPAM conjugates can enrich more easily at the oil/water interface with BSA section dissolved in water and polymer tail merging into the oil solution. By controlling the size of water@oil droplet and cross-linking BSA, stable proteinosomes with diameters in the range of 25–50 μm were facilely synthesized. The proteinosomes demonstrated ultrathin membrane structure with great stability, which remain their structural integrity upon vacuum evaporation or over several weeks. Myoglobin-PNIPAAm and hemoglobin-PNIPAAm conjugates were also proved to form similar proteinosomes through this method, revealing this strategy a versatile way to yield proteinosome protein materials. The proteinosomes were further applied as scaffolds to mimic biologic cells. pEXP5-NT/eGFP plasmid for eGFP expression and cell-free expression solution were capsuled during the assembling process of proteinosomes to obtain the protocells (Fig. 16b). Fluorescence microscopy suggested that eGFP can be expressed within the proteinosomes in vitro. This study provides us a robust and facile way to prepare protein assembly and fascinating approach as scaffold to produce functional materials such as selective permeability, protocells, and multiple enzyme reactors. In this chapter, we aim to introduce natural and artificial protein assemblies to the readers. 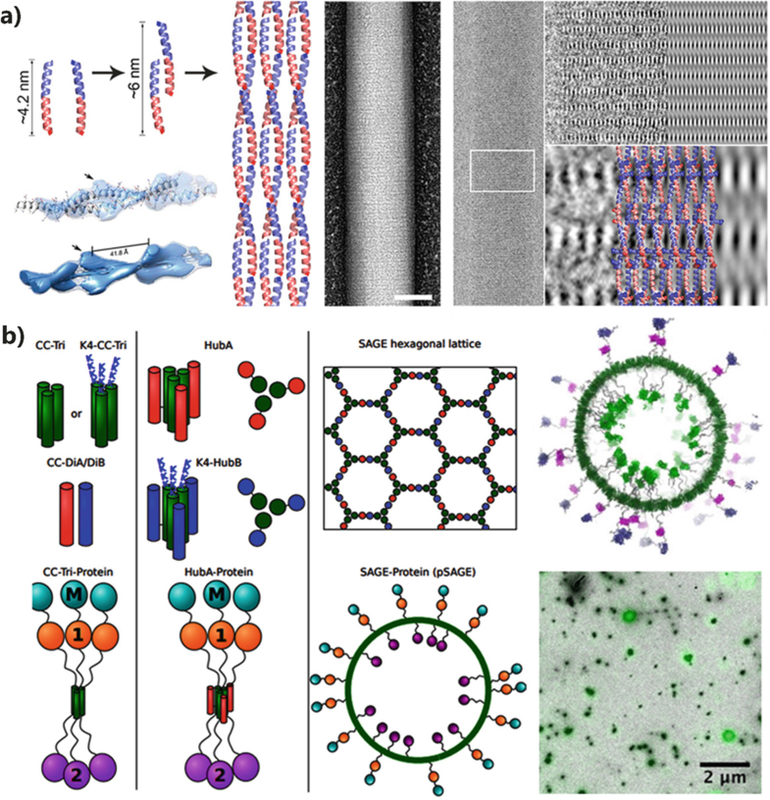 Typical natural protein assemblies and several supramolecular assembling strategies for constructing artificial protein nanostructure were reviewed and demonstrated their attractive function. In the first section, the self-assembling mechanisms of natural protein polymers with various morphologies and functions were described. Because of their facile preparation and repeatability, natural protein assemblies were fascinating scaffolds to functionalization and produced materials such as cellular adhesive materials, sensors, vesicles, bioimaging, and drug deliver. Afterward, based on understanding of natural protein assemblies and supramolecular chemistry, we briefly narrated main strategies for construction of artificial protein assemblies and functional materials. In summary, protein-protein interaction, peptide-specific binding, Coulomb force, metal ion coordination, host-guest interactions, protein-ligand interaction, and hydrophobic effects were described, and several examples were taken. By combining rational design, modification of protein, and external noncovalent supramolecular strategies, people have achieved protein assemblies from simple oligomers to the large-scaled protein polymers with highly ordered nanostructures such as 0D nanocages, 1D fibers and nanotubes, 2D layers or lattices, and 3D micellar morphologies and crystals. Compared with other assembling system, protein assembly demonstrated several fascinating advantages in materials and health-care aspects. Besides the incomparable biocompatibility, the abundant source of natural proteins with rich symmetries or functions could be utilized as building blocks to drive the programmable protein assemblies, revealing its limitless possibility in preparing biomaterials with various defined nanostructures and practical applicative functions. Meanwhile, benefiting from further understanding national protein assembling process, the mechanism has provided us a sight to fabricate and design novel proteins and superstructures in de novo on purpose based on computer simulation and protein-associated database and inspired us novel idea for treatments of diseases such as protein aggregation-related disorders in health-care field. Despite having been developed in recent years, in our opinion, the protein assembling still needs more efforts in several main aspects: First, although extended strategies for design and construction of protein assemblies have been discovered and reported as we described above, exploration of mechanism and novel methodologies of different protein assemblies is an important research faction in this field yet. The discovery of mechanism and novel methodologies would broadly open new rules and theories for better understanding of natural protein assemblies and preparing novel protein assemblies. In addition, the next-generation protein assemblies tend to cooperate two or more biological and chemical strategies, endowing assemblies more properties and ultimately producing compelling novel biomaterials on purpose rather than mimicry. Second, the institutionalization of protein assemblies has become more and more attractive to scientists. To fabricate the functional materials, using supramolecular-induced protein assemblies is the final goal for practical applications. In decades, utilizing proteins with intrinsic properties as building blocks, modifying chemical functional groups on protein scaffolds, and creating sophisticated structural traits during the protein assembling process are the main optimal design strategies to obtain functionalized protein assemblies; catalytic, dynamic, stable, photoelectric, smart biomaterials, etc. have been explored. The further functionalization would be focus on more biological associated aspects. For example, the protein biomaterials perform communication with biologic systems, mimicking, participating in, and regulating original execution of life based on the statements of biologic systems on purpose. This would provide scientists more fascinating application for understanding life or treatments in health care. Third, in vivo assembling seems the best choice to directly execute the cellular functions. However, compared with assemblies in vitro, in vivo assembling demonstrates more challenges due to complicated cellular environments and its matters such as stability, reparative ability, pharmacokinetics, adverse host reactions, toxic effects, and biodegradation. Several works have demonstrated the enchantment of in vivo protein assembling which endow the novel properties for cell and attract the attentions of scientist. The goal of generating highly ordered protein assemblies with advanced functions and wide-ranging applications in a reliable, controlled, and reproducible way will constitute an important future challenge, which requires an intimate collaboration between scientists in various disciplines such as nanoscience, materials science, and chemical biology as well as structural and synthetic biology to support the rapid development of this highly interdisciplinary research field.